York based Roche Legal are celebrating a remarkable hat-trick of award wins after receiving the Raising the Bar Community Award at the Leeds Civic Hall last night (Tuesday 27th November). The latest honour follows Roche Legal’s success in being named the Socially Responsible Business of the Year at the recent annual Press Business Awards while Rachel Roche received the Law Society Sole Practitioner of the Year award in London. The Raising the Bar awards, organised by the West & North Yorkshire Chamber of Commerce, enable businesses and employees to be recognised for the hard work they put in to improve their local areas and also the region they work and live in. Roche Legal won the small business category with the judges acknowledging the company’s enthusiastic support of causes and charities both locally and nationally and their focus on helping the community. “Roche Legal are always looking for ways to support our local community while continuing with our commitment to give a voice to the elderly and vulnerable. We are passionate in our support of charities whose causes are close to our hearts and determined to raise awareness of the fantastic work they undertake, both locally and nationally. “We specialise in Private Client work and have a strong focus on helping the elderly deal with what can, at times, seem daunting legal matters. All our staff are Dementia Friends and we are acutely aware of the challenges faced by clients who are living with or caring for someone living with a form of Dementia. Three of us are Dementia Friends Champions, able to give information sessions to the public and businesses. Roche Legal, which has offices in York and Harrogate, linked up with the York Teaching Hospital Charity to publicise their Make A Will Week scheme. Do you know what to do when someone dies? 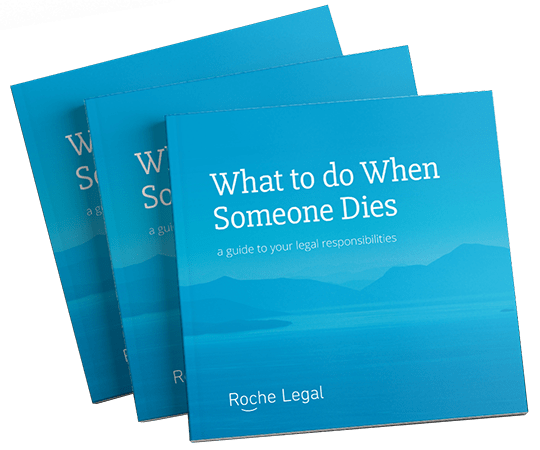 Download our handy guide which explains all the legal responsibilities you will encounter when someone close to you dies.